Off for an hour and a half to explore the progress of the bikepath along the railway… south and east along the line from Oakleigh to Dandenong, then turn around retrace my steps. Well they can’t call it a bikepath as there aren’t many in Victoria – it’s a Shared Footpath which means you’re allowed to ride on it, but pedestrians have absolute priority. Still, if they finally fill in a few of the gaps and connect up the disjoint sections, it’ll be a big improvement on the current state of affairs. 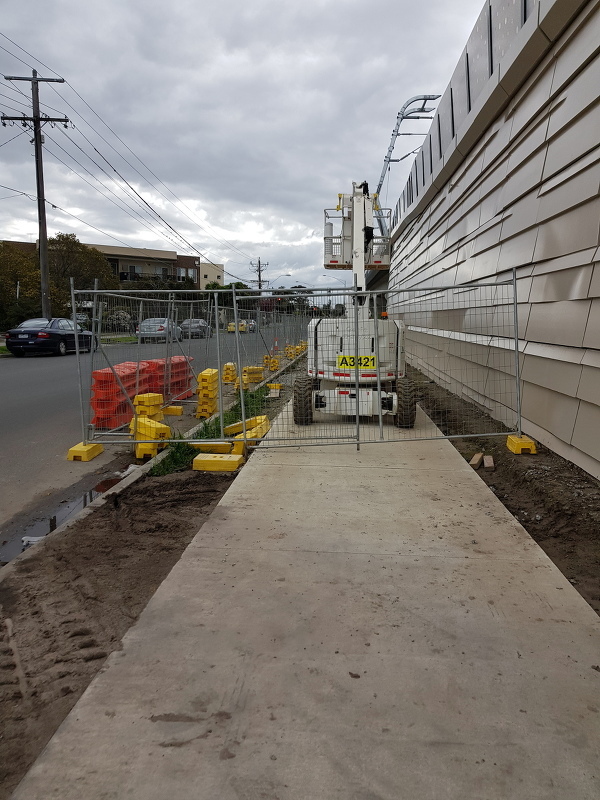 Hughesdale to Oakleigh is still on-road, although the new path from Galbally reserve to Oakleigh station is under construction. Everyone is still very much in the dark on how the new path on the south side of the train tracks joins the old path on the north side of the tracks. I’ve heard three options from three groups who all “know” – one is a “get off and walk” section through the station underpass – a typical Melbourne approach to cycling facilities – build a bike path that you’re not allowed to ride a bike on. Option two is a new underpass at the east end of the station car park, we were told this was being built by a crew of workmen some months ago but it doesn’t seem likely. The third option is a brand new ground pedestrian and cyclist level crossing half way down towards Huntingdale … which would mean that the Level Crossing Removal Authority would be building a new level crossing. Seems unlikely. I guess we just have to wait for this one to take shape. Back to today’s ride, parallel to the railway lines on the south, along Haughton road. I can see on the other side of the tracks the existing path from Oakleigh station to Huntingdale station – it’s half accessible. The path closed completely in February “for a month” and is currently blocked for half its length. 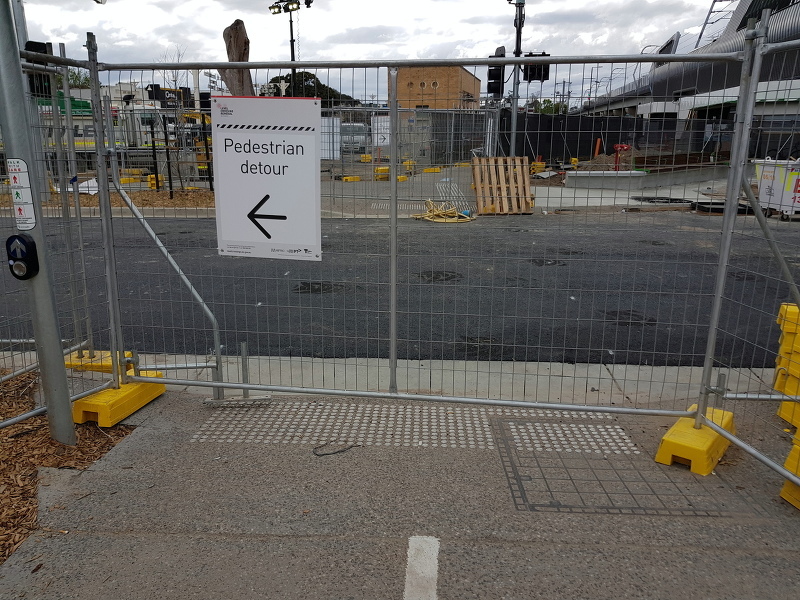 Stayed on the roads and bypass Huntingdale station – Huntingdale station forecourt has been rebuilt and the resulting integration of the shared path is woeful. Another “get off and walk” cycling facility that you’re not allowed to cycle on. Huntingdale to Clayton is mostly inaccessible behind construction hoardings, there’s still a lot of construction work going on and the parks and paths haven’t been started yet. At Clayton road I crossed over to the north side of the rail lines, passing under them, partly forced by a new fence across the middle of the road that prevents cyclists and pedestrians from crossing the road. On down Carinish road parallel to, and almost under, the raised section of railway until I reached Centre road and met the first bit of workable new cycling infrastructure! There’s a new set of cyclist/pedestrian lights to let you cross Centre road and they join up with the existing shared path on the far side, enabling you to continue on down towards Westall station. Well, half-way to Westall station anyway. For reasons unknown the shared path has always ended abruptly at Browning avenue and forced you back onto the road for a block, then you turn left into Oakes avenue, continue on a little way and join the re-started off-road path. At least this missing section appears to be being filled in – a new section of path has been built, but is still fenced off. Back on the path for another hundred metres or so towards Westall and there’s the ubiquitous Melbourne bike path sign “End Bike Path” – from now on pedestrians only! The path itself continues to Westall station and then to pass under Westall road, and most cyclists still ride along it. Many maps show it as a valid shared path so I really don’t know if the maps are wrong or the sign is wrong. At Westall road the shared path that might not be a shared path dumps you out into the service lane of Westall road and you’re left to ride through semi-industrial back streets, all signage has vanished. Continued on around Osborne avenue until I rejoined the railway three-quarters of the way to Springvale station, here the shared path miraculously reappears, until at Springvale road a near useless pair of interlocking chicanes bar the path. Judging by the path worn into the grass I did what everyone else does here and rode around the chicanes. Past Springvale and as I was riding along Lightwood road I realised that there was a lovely new concrete shared path on my left so I bumped up the kerb and took it for a spin. Its definitely a work in progress! The open sections are lovely and wide and smooth, but most of the road crossings and work around the stations hasn’t been completed, so there are some confusing signs telling you that the path is closed… and some instances where I came up across the back of one of these signs, a section of path that is open when you come in from one end, but not if you come from the other! Finally just before Yarraman station the new path ends and I was back on the road, then detoured under the Eastlink motorway for a few minutes’ rambling around in the old Dandenong showgrounds, pursued by an aggressive Pied Butcherbird, then back out to retrace my route home. 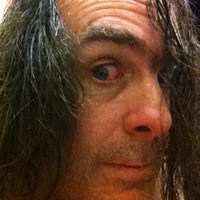 Getting home was the reverse of the above, except for where it wasn’t. Meeting some of the directional signs from the other side had me use other minor sections of paths from the ones I used on the way out. Hard to tell what the end result will be, the missing link sections look promising, I think that the treatment around the new stations will make it relatively easy for anyone want to ride through – not just to – a station. I suspect that the path along the older sections will be left as it is and that as a result, the Oakleigh to Huntingdale to Clayton section will be a mess. I’ll have to repeat my exploration in a month or two as more is built.